For Breakfast this chilly morning I Scrambled some Egg Beater’s Egg Whites seasoning it with Lite Salt, Ground Black Pepper, and a dash of Ortega Smoky Chipotle Taco Sauce. I like using the Smoky Chipotle whenever I can, nice heat and a lot of flavor. Then I heated up a few slices of Boar’s Head Sweet Sliced Ham and toasted a Healthy Life Whole Grain English Muffin. Loaded the Egg Whites, Ham, and a slice of Sargento Reduced Calorie Swiss Cheese on to the English Muffin and I had a delicious Breakfast Sandwich! Also had a cup of Bigelow Decaf Green Tea. Went out to get the morning papers and it was snowing pretty good out there. I salted the driveway, which is on a hill, last night before I went to bed. Which helped somewhat. Not long after Breakfast I got the Crock Pot ready and put my Chili on. Which is tonight’s Dinner, 3 Bean Turkey Chili w/ Johnny Cakes. Picked a perfect day to make Chili, our first snow of the Winter is falling. They call for 2-3 inches, what better on a Winter’s Day than Chili! And I’m ready for some Chili! You can use Jennie – O Extra Lean Ground Turkey Breast or Wild Idea Ground Buffalo. Either version turns out great! I had none left of the last batch in the freezer so it was time for a new batch! To make this I’m using Jennie -O Lean Ground Turkey. The 3 Beans I use are 1 Can (16 oz.) Bush’s Chili Beans (Black Beans), 1 Can (16 oz.) Bush’s Chili Beans ( Kidney Beans), 1 Can (16 oz.) Bush’s Chili Beans (Great Northern Beans) drained and rinsed, Then I mix in 1 Red Onion (medium Chopped or Minced), 1 Jalapeno Pepper (Seeded and Chopped), and 3 Cloves Minced Garlic. For my spices I use 1 Packet McCormick Chili Mix, 2 Cans (6 oz.) Hunt’s Tomato Paste (2 cans), 1/2 Tsp Ground Cocoa Chili Blend (McCormick), 1/2 Tsp Ground Chipotle Chili Pepper (McCormick), 2 Tbs. Ground Roasted Cumin (McCormick), 2 tbsp Ground Cinnamon (McCormick), 1 Tbs of Cilantro Leaves (McCormick), and 5 Dashes of Frank’s Hot Sauce or to taste (I usually add a lot more dashes!). What’s good about this recipe you can use your own favorite Spices and make your own tweaks to it and it turns out delicious. I started by opening all 3 cans of Bush Beans into a large bowl and stirred until mixed. I then added the Beans to the Crock Pot. To prepare the Turkey, I started by browning the Jennie -O Ground Turkey. Using a large skillet sprayed with Pam Cooking Spray and 1 tablespoon of Extra Virgin Olive Oil. Preheat the skillet on medium heat. When heated I add the Ground Turkey and all the seasonings and Tomato Paste, stirring often. When the Turkey has browned I add from the skillet to the Crock Pot. Throw in a 1/2 cup of Water, stirred twice, and put the lid on the Crock Pot and set on low for 5-6 hours. The full recipe and list of ingredients is at the end of the post. Then sit back and enjoy the aroma that usually starts after an hour or so of simmering! I love a thick Chili and this one works! The Jennie – O Ground Turkey combined with all those Beans and spices is a perfect match. Served it topped with some Sargento Reduced Fat Shredded Sharp Cheddar Cheese and a couple of shakes of Frank’s Red Hot Sauce. Also a side of Johnny Cakes, recipe below. To prepare the Johnny Cakes (I love these…) all you’ll need is: Pam w/ Olive Oil Non – Stick Spray, 1/4 cup Extra Light Virgin Olive Oil, 1 3/4 cups Low Fat Buttermilk, and 2 cups Martha White Self Rising Enriched White Corn Meal Mix. Just mix all your ingredients in a large bowl. Spray your Pam on a Flat Top Griddle or large Skillet and preheat on medium low, I use the Flat Top Griddle. When the Griddle is heated add your batter. You can make the Cakes any size you want from half-dollar size to regular pancake size cakes. After the bottom side turns golden brown flip over and let the other side get golden brown. The Cornbread works perfect with Chili! I had a Diet Dr. Pepper to go with my Dinner. For dessert later a slice of the Hill and Valley Sugar Free Angel Food Cake, purchased at Meijer, topped with Cool Whip Free. I forgot, Did I tell you how much I love this Chili! For Breakfast on this Sunday Morning I prepared Skillet Potatoes and Ham for Breakfast. I used 1 package of Simply Potatoes Steakhouse Seasoned Diced Potatoes and a package of Meijer Diced Ham to prepare it. Just cook the Potatoes according to the package instructions and with about 5 minutes of cooking time left add the Diced Ham. I topped everything with a Sunny Side Egg and a sprinkle of Sargento Reduced Fat Shredded Sharp Cheddar. I am a Potato Freak! Diced, scalloped, baked, or fried it makes no difference I love Potatoes! After Breakfast I did a load of laundry for Mom. Mom went on to Church and I stayed here with Dad. Someone has to be here with him all the time anymore. So anyway with the laundry started I cleaned the house, ran the vacuum and dusted. Then on outside and got the leaf blower out and cleaned the deck and driveway of leaves. Had everything done so it was time to sit back and watch some NFL Football the rest of the afternoon. For Dinner tonight a favorite of mine, 3 Bean Turkey Chili w/ Johnny Cakes. I’m ready for some Chili! With the Fall weather in full swing its hard to beat a bowl of homemade Chili! 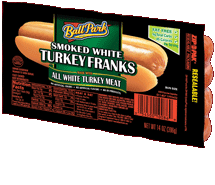 You can use Jennie – O Extra Lean Ground Turkey Breast or Wild Idea Ground Buffalo. Either version turns out great! I had none left of the last batch in the freezer so it was time for a new batch! To make this I’m using Jennie -O Lean Ground Turkey. The 3 Beans I use are 1 Can (16 oz.) Bush’s Chili Beans (Black Beans), 1 Can (16 oz.) Bush’s Chili Beans ( Kidney Beans), 1 Can (16 oz.) Bush’s Chili Beans (Great Northern Beans) drained and rinsed, Then I mix in 1 Red Onion (medium Chopped or Minced), 1 Jalapeno Pepper (Seeded and Chopped), and 3 Cloves Minced Garlic. For my spices I use 1 Packet McCormick Chili Mix, 2 Cans (6 oz.) Hunt’s Tomato Paste (2 cans), 1/2 Tsp Ground Cocoa Chili Blend (McCormick), 1/2 Tsp Ground Chipotle Chili Pepper (McCormick), 2 Tbs. Ground Roasted Cumin (McCormick), 2 tbsp Ground Cinnamon (McCormick), 1 Tbs of Cilantro Leaves (McCormick), and 5 Dashes of Frank’s Hot Sauce or to taste (I usually add a lot more dashes!). What’s good about this recipe you can use your own favorite Spices and make your own tweaks to it and it turns out delicious! I started by opening all 3 cans of Bush Beans into a large bowl and stirred until mixed. I then added the Beans to the Crock Pot. To prepare the Turkey, I start I started by browning the Jennie -O Ground Turkey. Using a large skillet sprayed with Pam Cooking Spray and 1 tablespoon of Extra Virgin Olive Oil. Preheat the skillet on medium heat. When heated I add the Ground Turkey and all the seasonings and Tomato Paste, stirring often. When the Turkey has browned I add from the skillet to the Crock Pot. Throw in a 1/2 cup of Water, stirred twice, and put the lid on the Crock Pot and set on low for 5-6 hours. Then sit back and enjoy the aroma that usually starts after an hour or so of simmering! I love a thick Chili and this one works! The Jennie – O Ground Turkey combined with all those Beans and spices is a perfect match. Served it topped with some fresh Shredded Dutch Gouda Cheese and a couple of shakes of Frank’s Red Hot Sauce. Also a side of Johnny Cakes, recipe below. For dessert later a Jello Sugar Free Dark Chocolate Pudding. To prepare the Johnny Cakes (I love these…) all you’ll need is: Pam w/ Olive Oil Non – Stick Spray, 1/4 cup Extra Virgin Olive Oil, 1 3/4 cups Low Fat Buttermilk, and 2 cups Martha White Self Rising Enriched White Corn Meal Mix. Just mix all your ingredients in a large bowl. Spray your Pam on a Flat Top Griddle or large Skillet and preheat on medium low, I use the Flat Top Griddle. When the Griddle is heated add your batter. You can make the Cakes any size you want from half-dollar size to regular pancake size cakes. After the bottom side turns golden brown flip over and let the other side get golden brown. Today was our Community Annual Yard Sale, Fred Stanford would have a field day today around here! Taking a tour of the Park it looks as though neighbors bought their neighbor’s junk from last year and now are reselling it this year. Only in the eye of the beholder! It was little hotter out and bit more humid out today, nothing too bad though. Really didn’t want a big meal tonight so I went with a family favorite, Chili and Cheese Nachos! I used Tostitos Multi Grain Scoops for my Chips. I love these with Salsa or just as snack by their selves, they bake and hold their shape real good. For my toppings I used 1 can of Mario Sliced Black Olives. Before I go any further a bit about these Olives, anyone that uses small cans of Sliced Black Olives know what a pain they can be opening sometimes. Not these, they come in a can with a pull tab! About time. For my other toppings I used some Sliced Green Olives, Mezzetta Deli Sliced Jalapeno Peppers, Hormel Turkey Chili with Beans, a few shakes of Frank’s Red Hot Sauce, and Sargento Reduced Fat Mozzarella and some fresh grated Murray’s Dutch Gouda. To prepare I preheat the oven at 400 degrees and sprayed a glass baking dish with Pam and layer everything in. I start with a couple of tablespoons of Chili then I add my Scoops (Chips). 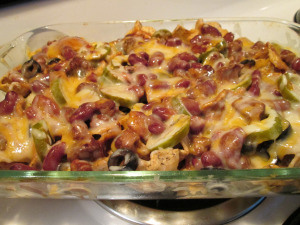 I then add the Sliced Black Olives, the Chili, Sliced Jalapeno Peppers (Love These), and then top everything the Cheese Blend. Then just pop it in the oven 10 minutes or so until the Cheese had started to melt and everything heated. For the Chili I warm it up in a sauce pan, adding a few shakes of Frank’s Red Hot Sauce, before I top the Scoops with it. 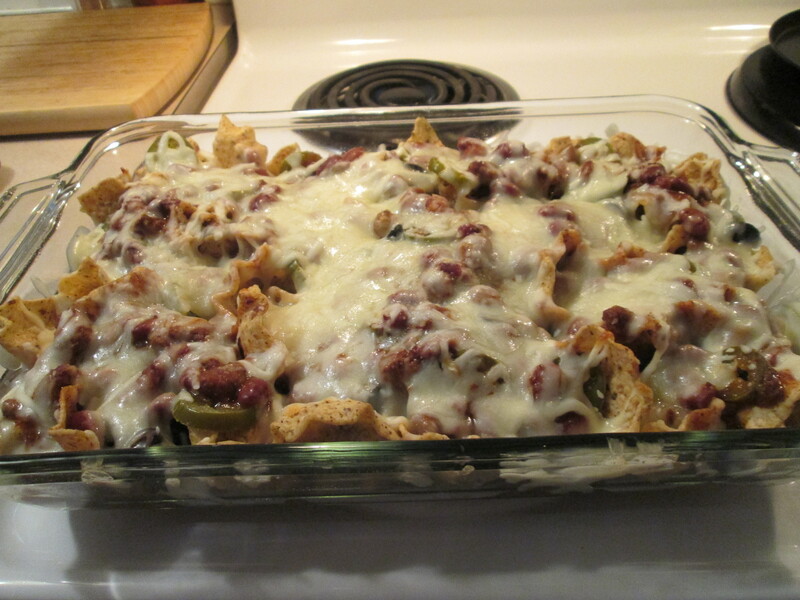 Nothing better than a big plate of Chili Cheese Nachos! Also had an ice-cold Diet Dr. Pepper to drink. For dessert later a Healthy Choice Dark Fudge Swirl Frozen Yogurt. 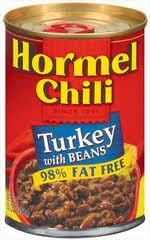 Turkey with beans 98% fat-free favorites: Hormel chili in a layered dip! Hormel chili in a rice CASSEROLE! I used Tostitos Multi Grain Scoops for my Chips. 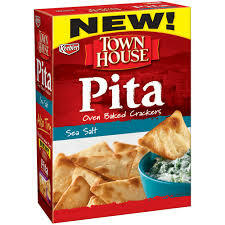 I love these with Salsa or just as snack by their selves, and they bake and hold their shape real good. For my toppings I used 1 can of Mario Sliced Black Olives. Before I go any further a bit about these Olives, anyone that uses small cans of Sliced Black Olives know what a pain they can be opening sometimes. Not these, they come in a can with a pull tab! About time. 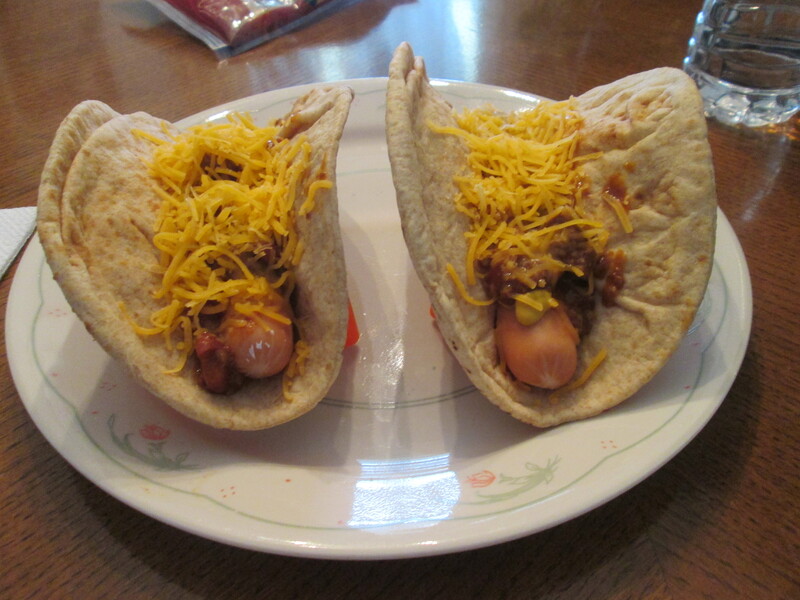 For my other toppings I used Mezzetta Deli Sliced Tamed Jalapeno Peppers, Hormel Turkey Chili with Beans, a few shakes of Frank’s Red Hot Sauce, and a blend of Sargento Reduced Fat 4 Cheese Italian Shredded Cheese and Sargento Reduced Fat Mozzarella. I hadn’t used the Hormel Turkey Chili with Beans in a while I had been using Campbell’s Firehouse Chili with Beans but I just wanted to switch it up. To prepare I preheat the oven at 400 degrees and sprayed a glass baking dish with Pam and layer everything in. I start with a couple of tablespoons of Chili then I add my Scoops (Chips). I then add the Sliced Black Olives, the Chili, Sliced Jalapeno Peppers (Love These), and then top everything the Cheese Blend. Then just pop it in the oven 10 minutes or so until the Cheese had started to melt and everything heated. For the Chili I warm it up in a sauce pan, adding a few shakes of Frank’s Red Hot Sauce, before I top the Scoops with it. 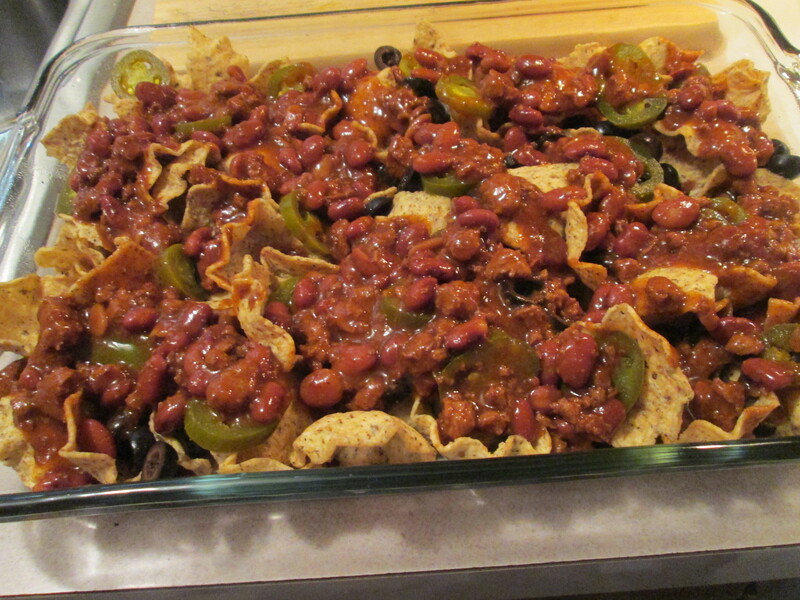 Nothing better than a big plate of Chili Cheese Nachos on a very cold day! Had an ice-cold Diet Dr. Pepper to drink also. For dessert later a Del Monte No Sugar Added Mango Chunk Cup. Stove top: empty chili into saucepan. Stir occasionally while heatingover medium heat, about 5 minutes or until hot. Microwave: empty chiliinto microwaveable bowl; cover loosely. Heat for 2 To 3 minutes or untilhot, stirring once. Careful. Let chili stand in microwave 1 minute and stir before serving. All microwaves And stoves vary. Times given areapproximate. Made a batch of the 3Bean Turkey Chili! Love this stuff. Not only is it delicious and healthy it’s easy to make and it’s a 1 pot meal! Just “Set it and forget it”, my favorite info commercial saying. About 5-6 hours on low in your crock pot and you’ll have some great tasting chili! 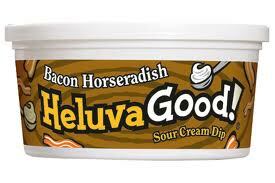 This is great to freeze so you can have it anytime. I left the recipe at the end of the post. I topped the chili with some fresh grated Smoked Dutch Gouda Cheese and a side of Oyster Crackers. *COOK turkey in large saucepan on medium-high heat 10 min. or until no longer pink, stirring occasionally. Add all remaining ingredients except the cheese and crackers. *Serve in bowl or mug with cheese and the oyster crackers, or serve with some home made cornbread ears. I wanted some Cheese Coneys for dinner and I wanted them hearty! 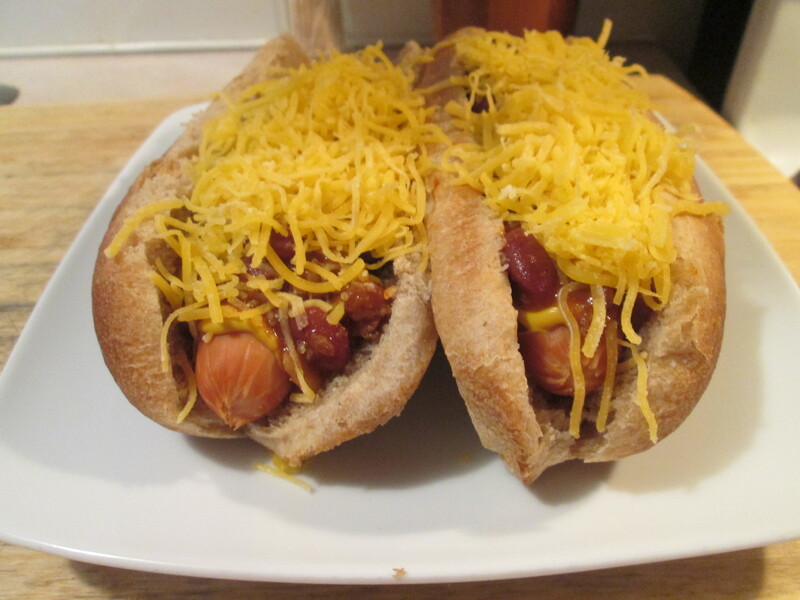 So I used Ball Park Smoked White Turkey Franks, Hormel Turkey Chili w/ Beans, Kraft 2% Shredded Sharp Cheddar Cheese, Frank’s Red Hot Sauce, and Healthy Life Whole Grain Hot Dog Buns. 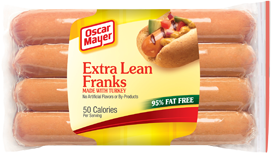 Boil the Franks 4 -5 minutes and while the dogs are boiling warm up your Turkey Chili in a small sauce pan. 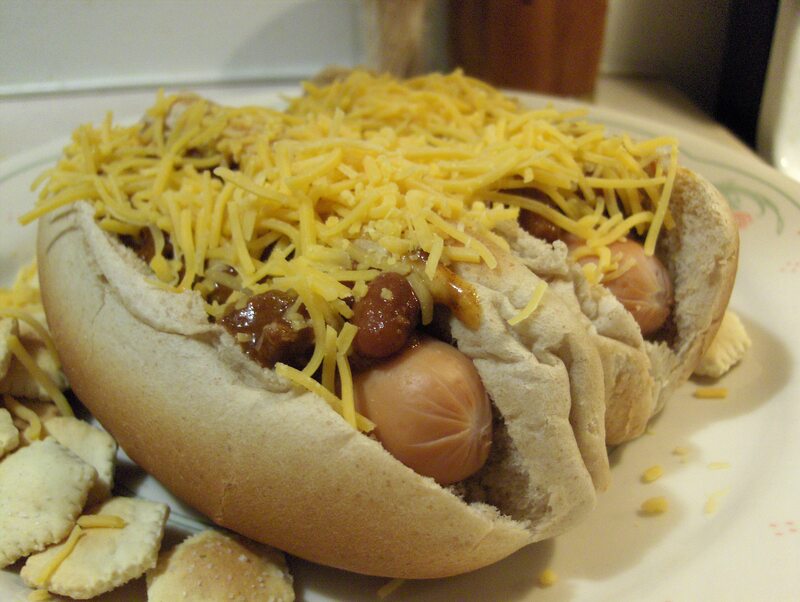 To assemble place the Hot Dog in the Bun top with the Turkey Chili, Frank’s Red Hot Sauce, add chopped Onions or Jalenpenos (Optional), a squirt of Yellow Mustard, and top with the Shredded Cheese. I also had a 1/2 a serving of Oyster Crackers. 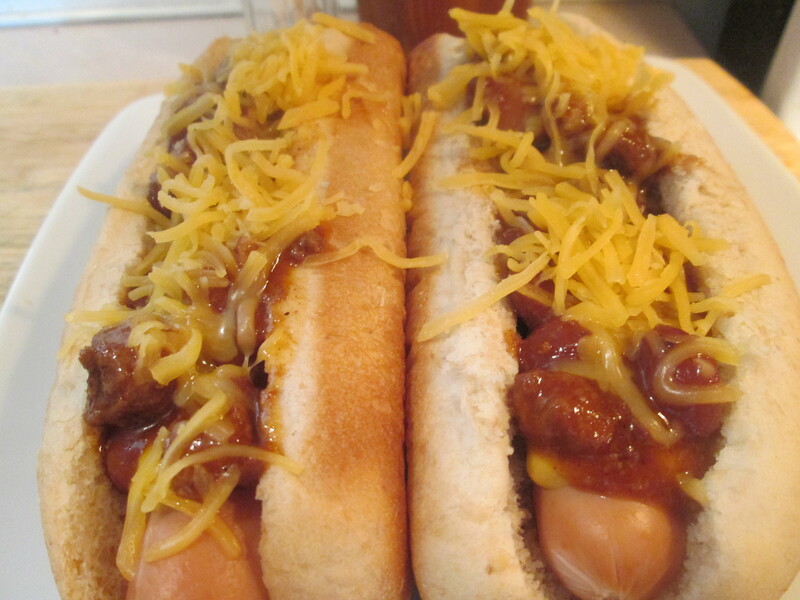 Now chow down on some delicious Dogs! For dessert later a Yoplait Delight 100 Calorie Chocolate Eclair Parfait.